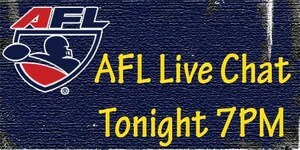 AFL Live Web Chat TONIGHT! 04/22/2011 8:22 AM - Iowa Barnstormers Brad Banks, Todd Blythe, Jesse Schmidt, and Brent Curvey will be online for a LIVE Web Chat at 7PM CST TONIGHT! Be sure to log on so you can ask questions and be apart of the the chat. CLICK HERE FOR THE LINK.